A collection of our favorite 35 Diwali Sweets and Savory Snacks recipes. Diwali is almost here. The biggest festival in India, popularly called the Festival of Lights, but here we would like to call it the festival of sweets and snacks. Why? Because pretty much every household in India and those outside of India but of Indian origin, start celebrating this festival days ahead with making several sweets and savories. Another big part of this festival is sharing these sweets and savories with friends and neighbors. It is kinda like Christmas, you bake a ton of cookies and other treats and share with everyone. Over the last couple of years, I have tried to post most of what sweets and savories I make at home during Diwali. 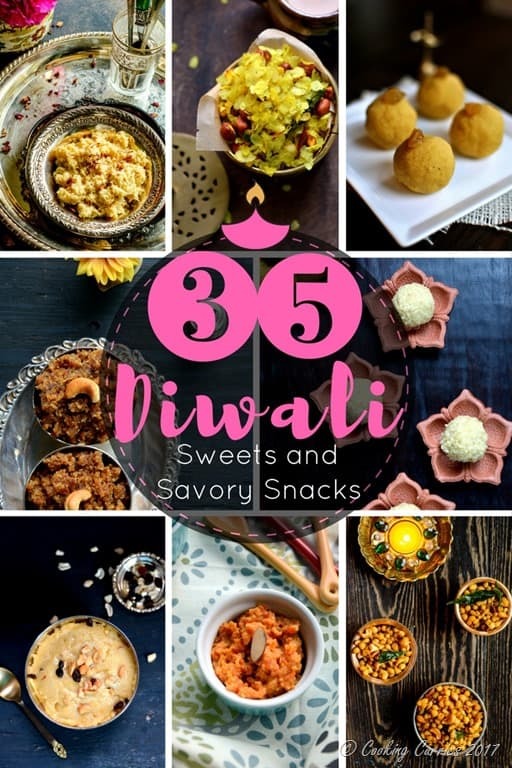 Here is a collection of 35 such favorite Diwali Sweets and Savory Snacks recipes, all in one place, for you to browse through, get inspired and make some for your friends and family. Do also check out 50+ Recipes for Diwali – Snacks, Appetizers, Main Course, Sweets, Desserts, Drinks. If you love these recipes / collections, please don’t forget to share or rate / comment below! Thank you and Happy Diwali!